always staying grateful and seizing every opportunity to create great things with great people. Travis leads a fantastically skilled and versatile team of Designers, focused on elevating the visual output of the agency while ensuring our client’s stories are told with purposeful pixels. Travis’ first love was illustration… and you never do forget your first. While you can still find him with a Wacom stylus in hand, he’ll attest that his passion and heart are his most valuable design tools. That heart started beating at AJ in 2012 and he’s been striving to bring beautiful, meaningful things to life ever since. 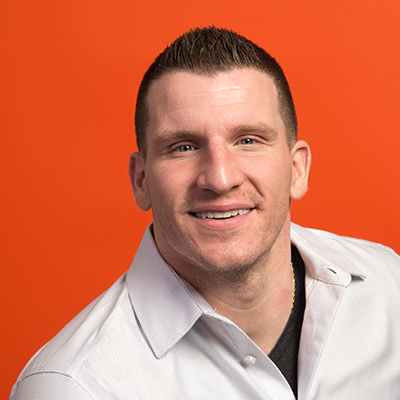 Whether it’s through creating brands or inspiring teammates, Travis’ passion is what fuels him. Travis feels his greatest career achievements are the relationships he’s made along the way. “The very best accolades are the connections and admiration built between those battling alongside you in the trenches,” he attests. He’s also had artwork on display in the Smithsonian… no big deal though. In his spare time, Travis is an absolute freak about NCAA Basketball, particularly Michigan State. You could say it’s in his blood, as he shares it with his Hall of Fame Cousin and MSU Head Coach, Tom Izzo.